To streamline the editing process for large workbooks, hide and show sheets as you work. What sheets can I hide? Sheets that aren't in a dashboard or story are always visible while editing workbooks. 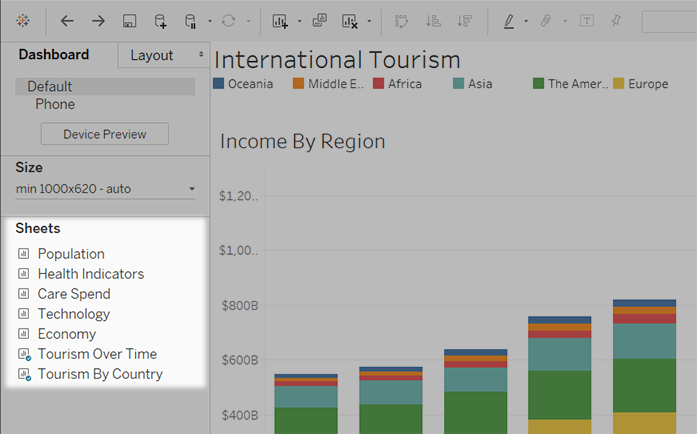 However, you can hide any sheet in workbooks you publish to Tableau Online or Tableau Desktop. See Comprehensive Steps to Publish a Workbook. 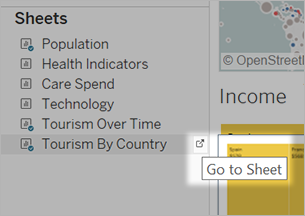 Note: If you're creating a viz in a tooltip, see Hide a Viz in Tooltip worksheet and Unhide a Viz in Tooltip worksheet. Right-click (Windows) or Control-click (macOS) the sheet name, and select Hide Sheet. 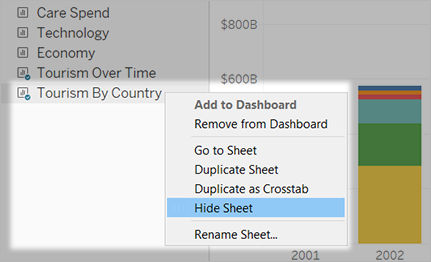 Note: From the sheets list to the left of a dashboard or story, you can hide only sheets used in that particular dashboard or story. You can identify these sheets by the blue checkmark on the sheet icon. If you're creating a viz in a tooltip, see these steps to hide the target sheet. At the bottom of the screen, click the tab for the dashboard or story that contains the sheet. You can identify dashboards and stories by grid and book icons, respectively. Note: If a story has a hidden dashboard that in turn has a hidden sheet, first go to the hidden dashboard from the story, and then to the hidden sheet from the dashboard. In the list at left, right-click (Windows) or Control-click (macOS) the sheet, and clear the Hide Sheet checkbox. Note: If you're creating a viz in a tooltip, see these steps to unhide the target sheet. While editing a dashboard or story, you can temporarily show a hidden sheet to get a closer look and change its structure. The sheet is hidden again when you switch to another sheet. On the dashboard itself, select the item that references the hidden sheet. Then click the drop-down arrow in the top left or right corner, and select Go to Sheet. In the Sheets list to the left of the dashboard, click the icon to the right of the sheet name.